↑ Moser، Charles. 1992. Encyclopedia of Russian Literature. Cambridge University Press. pp. 298–300. ↑ Briggs، Anthony. 2005. "Introduction" to War and Peace. Penguin Classics. ↑ Pevear, Richard (2008). "Introduction", War and Peace, Trans. Pevear؛ Volokhonsky، Larissa, New York City، New York: Vintage Books, VIII–IX. ISBN 978-1-4000-7998-8. ↑ Knowles، A.V. 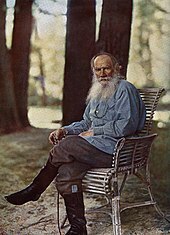 Leo Tolstoy، Routledge 1997.